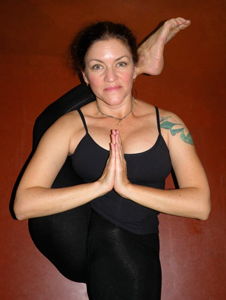 Leigha has been teaching yoga since 1984 and taught at Yoga Works in Santa Monica, California starting when it opened its doors in 1987. It was through Yoga Works and The Iyengar Yoga Institute of Los Angeles that she had the opportunity to study with senior teachers from all over the globe. Her love of Ashtanga Yoga brought her to India several times to study extensively with Sri K. Pattabhi Jois, and was authorized to teach by him in 1996. She continues to be inspired by Tim Miller, her main teacher in the West for over two decades. Leigha has a gentle approach and is passionate about bringing precise alignment to the graceful movements of traditional Ashtanga Yoga that make it a "moving meditation". She encourages students to embrace the contemplative aspect of the practice with attention to detail and the cultivation of awareness. Her teaching is infused with an intimate knowledge of anatomy that stems from a bodywork practice of nearly three decades, which enables her to address the specific needs of her students. Leigha's studies in meditation began with Osho, with whom she took sannyas in 1986. She continues her studies with both the Rinzai and Soto schools of Zen Buddhism. After teaching in the San Francisco area for seven years, Leigha moved to Crestone, Colorado in 2005 where she built a sustainable green home and yoga studio. She returns regularly to California to host a variety of trainings, workshops and group classes.